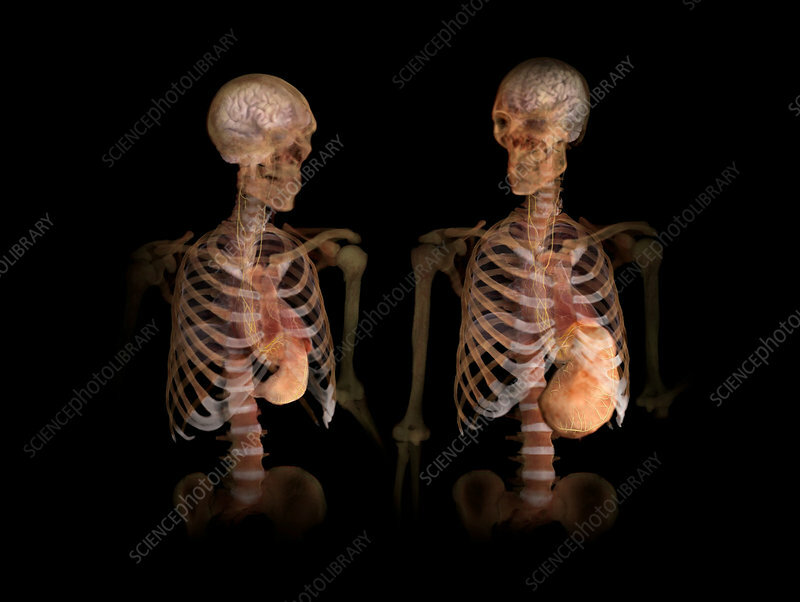 Medical visualization taken from human scanned data showing the difference between a normal, healthy full stomach and a stomach that has been filled too much. The stomach of the figure on the left is filled to normal capacity. The stomach of the figure on the right is stretched beyond its usual capacity by overeating, and has lost the ability to have a proper conversation with the brain about satiation. Empty calories (containing refined starches and sugars) are energy-dense but nutrient-poor, and raise insulin levels causing blood sugar levels to quickly crash. This drop in blood sugar levels makes the body crave quick energy and feel hungry more frequently. Nutrient-dense foods (high in fibre, protein, and fats) keep the body feeling full while maintaining steady insulin and blood sugar levels. These foods take more time to digest, leaving the stomach feeling fuller for longer.